* This is a simulation of a werewolf attack using Stata. * Initially there is X number of people on a map and a few werewolves. * Werewolves head toward whatever unprotected humans are on the map. * If they encounter a human they kill that human and go towards they next unprotected human. * Humans do not know about the werewolves until they become within sensory range - specified by the user. * Once they become within sensory range humans immediately seek the closest shelter. * Shelters are distributed throughout the map. * Once a human is in a shelter the human is safe. 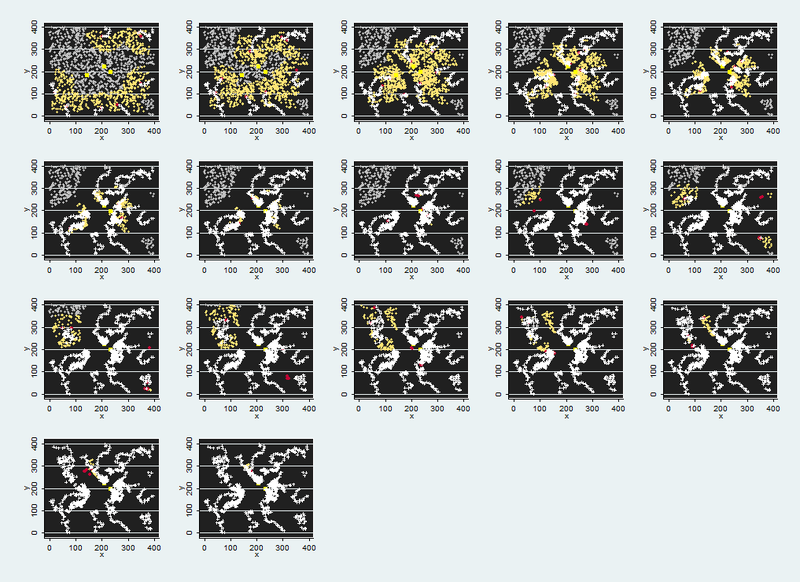 * This tells stata to either draw the graphs as it runs the code or wait till the end to draw the graphs. 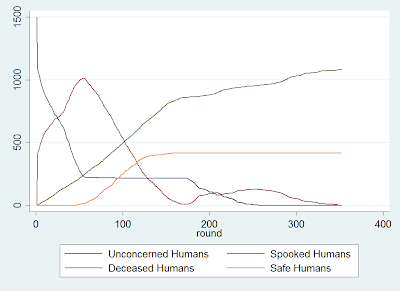 label var hmn_id "Human ID"
lab var ty "Observation type 1=human, 2=werewolf, 3=shelter"
"Deceased" 5 "Spooked Humans" 6 "Safe"
replace ty = 2 if ty==. label var were_id "Werewolf ID"
replace ty = 3 if ty==. label var shelter_id "Shelter ID"
* Looks pretty good so far. 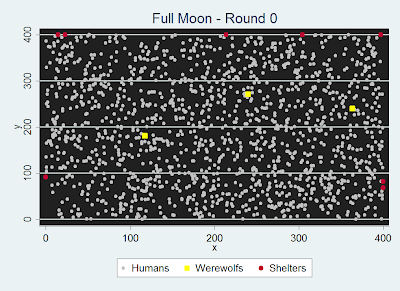 * People shelters and werewolves are uniformly throughout the data. * This makes it so the werewolves start on one of the sides of the map. * First we will calculate which direction and where the humans will run. * This direction is constant since humans do not try to avoid werewolves, they just run for shelter. 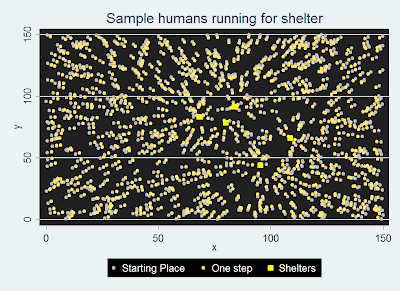 * We will loops through shelters and calculate distance for each human. 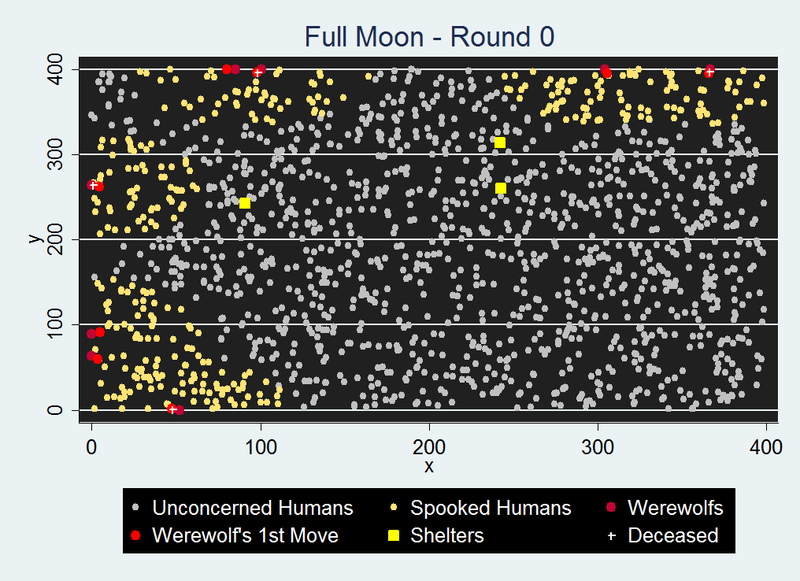 * The first x number of observations are the werewolves. * Now let's calculate the distance of the spooked humans from the shelters. * We can see in out list of shelters there is unwanted comma. * For now we will just fill in an meaningless value to prevent error. * Now we will calculate the ideal trajectory for each human given that human is running for shelter. * We know a, b, c [see graph] and the next section for algebra. * I loop through each of the werewolves. * Each werewolf will survey all of the humans and find the one who is the closest. * Now let's calculate the distance of that werewolf from the humans. * We take the square but for finding targets it is unnecessary since the ranks of the different distances remains constant. * The top of this list is the target human. 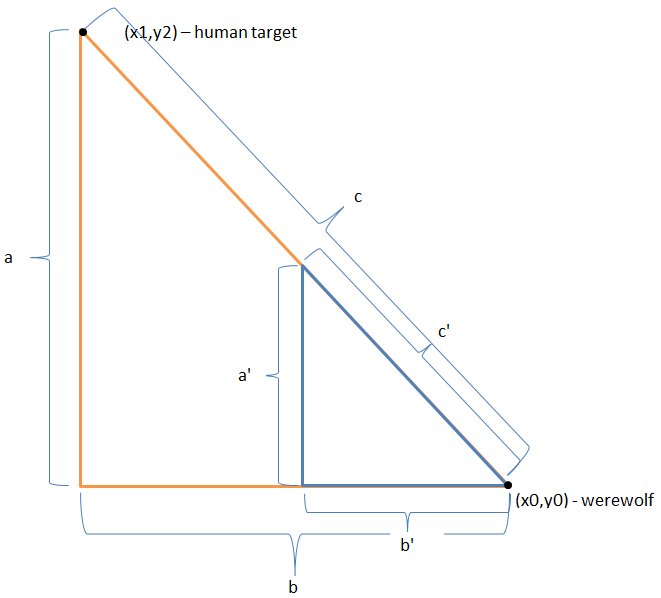 * If a human is less than `werewolf_speed' distance from the were and it is the closest to that were then the human is dead. * Now we need to calculate the attack vector. 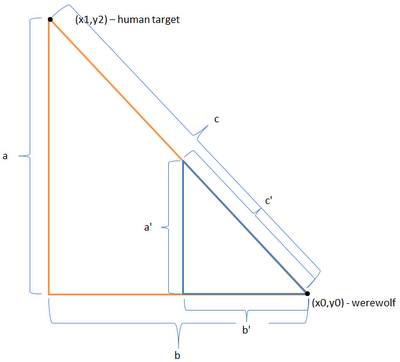 * Ie, what is the linear projection that gets the werewolf from its current location to the human fastest (in terms of x and y movement)? * We can use some algebra and a little trig to find the proper vector. * It is important to note the direction that the werewolf needs to travel as well. noi di "Werewolf `i' moves"
* Move spooked humans towards shelters. * Once a human gets to a shelter, that human is considered safe. * And c' which is equal to the speed of werewolves. * (c) Francis Smart 2012. Why use R? Five reasons. The importance of Graphing Your Data - Anscombe's Clever Quartet! R vs Stata Non-linear least squares!